Service providers on Fuerteventura - Map, shops, sports, etc. "Island tour" - that's a trip across the whole island of Fuerteventura, entirely private and individual. We drive to the most beautiful places of Fuerteventura (caves, impressive mountain landscapes, exciting canyons,...) with a small minibus (up to 4 persons). Tours daily from 10 am to 4 pm.No sales tour! No position plan available since the tour guide operates on the entire island of Fuerteventura. 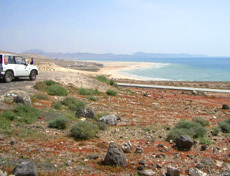 We drive with a minibus and explore Fuerteventura in a private and individual way. On request, we visit a goat farm and a small idyllic tapas bar which is situated directly on the seaside in a small fishing village. Customers pay cash at the end of the round trip. I'd be very happy if you joined me on an island tour! Fuerteventura alternativ is not responsible for this offer and its contents.See legal notice!